Did you Click on Mr Jackpot? The crazier you go the more cash you get! Ready for your first challenge? Walk around clucking like a chicken, flapping your wings and scratching the ground with your foot for $50. What a crazy chicken you are! You’ll have the other chooks going bok-bok-berserk! I hope you’re not too hen-pecked to try your next task. Slip on a bathrobe and pretend to be a boxer entering the ring for their next bout. Don’t forget to wave to the crowd and shadow-box. What a knock-out performance! You’ve just won another $100. Okay champ, complete this last challenge to win $200 and become the World Champion of Crazy for Cash. Tie a streamer or piece of paper to a stick and perform an artistic gymnast routine like they do in the Olympics. Make sure you twirl your streamer and perform jumps and twists. Don’t be afraid to try some rolls on the ground. Finish with a bow and ask anyone watching to score you. Congratulations! While that was a 10/10 performance, there’s no such show as Crazy for Cash! You are however, the newest star of Caught on Camera! A show where everyday people are caught doing crazy things on camera. Now stop blushing and get back to Matt Porter’s website! Do you think you can handle one of Mr Jackpot’s gameshows? 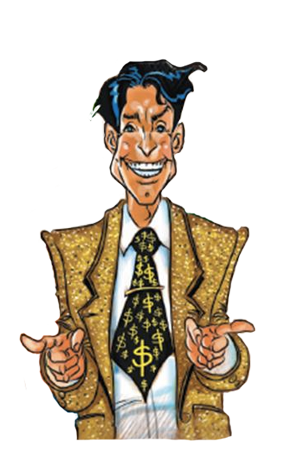 Listen to Mr Jackpot’s voiceover, and the bio of his new show – The Wheel of Misfortune! Now stop playing games and head back to Matt Porter’s website.